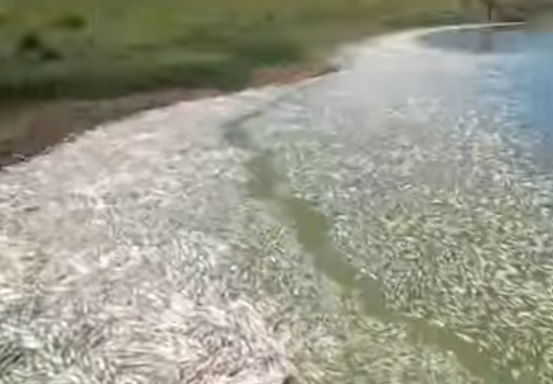 Surprise in San Luis as tens of thousands of dead fish wash up in a lagoon of Villa Mercedes, Argentina. This is not the first time, but the causes are unknown. According to the semi-arid site, the owner of the field where the water mirror is located said that this is not the first time it has happened. In that sense, El Diario de la República recalled that something similar happened five years ago, under similar climatic conditions, very hot, although with the level of the lagoon lower than now due to lack of rain. The causes so far are unknown but could be an overpopulation of fish combined with an algae bloom that removes oxygen, others attribute it to the lightning fall over the lagoon. The owner of the place also said that there are more ponds in the countryside, but this is the only one that has fish.